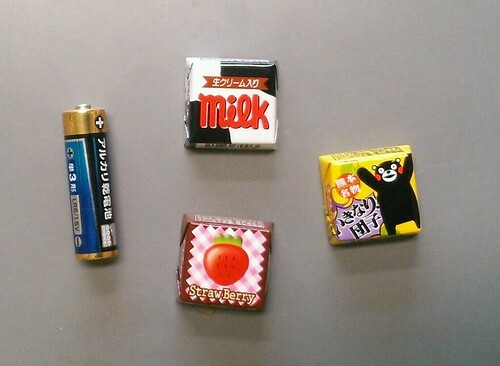 Japanese Chocolate Bars, a photo by timtak on Flickr. Is not for nothing that the Japanese have a low incidence of obesity. A typical British chocolate bar has as many calories as the average Japanese meal, after which if feeling a chocolate craving a Japanese may indulge in a postage stamp sized chocolate bar. And these above are the decadent new double sized ones (20yen). Until recently there were only the 10 yen chocolates that are half the size of those above. Logotherapy for Japanese Cancer Patients: What can tourists carry? Logotherapy for Japanese Cancer Patients: What can tourists carry?, a photo by timtak on Flickr. Today's Asahi Newspaper ran an article, by Ms. Riko Kawahara, introducing Dr. Keisuke Yamada who runs a cancer philosophy outpatients clinic for terminally ill Japanese. His advice is based upon that of Austrian Psychotherapist, Victor Frankl, the founder of "Logotherapy". In the above article Dr. Yamada is quoted as saying "in that time set aside for holding a dialogue on life and death It is as frightening as walking into the darkness together. But an ordinary humans words can become a light. I try to encourage them to be able to *narrate their lives*, to be able to see the light. " First of all I worry about the effectiveness of teaching self narrative in this situation for the reasons mentioned in a previous post. A Zen priest, a more traditional helping hand in the face of death, would be more inclined to encourage us not to narrate anything at all. Secondly this highlights a problem I having with my understanding of the Western and Japanese self and tourism. Yes, narration is extremely important in the West -- *we* really are homonarrans 人言 -- but so also equally important is "the light". Western pilgrims and tourists tour to gaze (Urry, 2002) and name (Culler, 1988) the image (Turner and Turner, 1995; Boorstin, 1992) even though they believe that the image is a qualia (Jackson, 1986), in the mind. Why should anyone need to go anywhere to get something which they believe to be in their mind? One way of answering this question may be to focus on what people believe themselves to "carry" (Frankl, 1962, p. pp. 56–57. quoted below). The standard Western (excepting Ernst Mach) understanding of images is as "qualia:" things in the mind. Western philosophers would have it that the "brave overhanging canopy" is something that we can, if not fold up, carry around. If we do "carry" it, then it stands to reason that Mary (Jackson, 1986) and Western tourists should have to travel to get images, and carry them back. Japanese name-places provide names, they are fountains of names. The Japanese tourists provide the images, of themselves (the ubiquitous Japanese tourist selfie or kinen shashin 記念写真) and through their imagination, and often quite physically carry, yes, carry the names back home, in the form of sacred tags （お札） stamps, from the ”stamp rally,” pilgrimage, such as to Shikoku's temples or Ise shrine, often for other people （代理参り）. Since Westerners tend to believe in a "super-addressee" (Bakhtin, 1986) I think that we believe also that words, names, or at least what they refer to -- meanings, ideas -- are somehow omnipresent. Words are transmitted, by morse code or telephone but what they mean somehow manages to get there, be recreated in the mind of the recipient, faster than the speed of light, because it is as if all the meaning is already in the recipients head already. To someone who believes in the super-addressee it is impossible to carry a word, in its full sense, anywhere. To explain the difference between Western and Japanese tourism I may need to focus less on the question, "What am I?" to "What can I carry?" What can we carry? Names? Images? When we die, is it true as the saying goes, "You can't take it with you"? When we die, can we only carry what we are? I have noted that "people of the book" live on as words because they are in the book, and that Japanese believe that the dead become balls of light. Culler, J. D. (1988). The Semiotics of Tourism. In Framing the sign. Univ. of Oklahoma Pr. Frankl, V. E., & Lasch, I. (1962). Man’s Search for Meaning: An Introduction to Logotheraphy. A Newly Rev. and Enl. Ed. of From Death-camp to Existentialism. Beacon Press. Plutschow, H. (1981). Four Japanese Travel Diaries of the Middle Ages. Cornell Univ East Asia Program. "We stumbled on in the darkness, over big stones and through large puddles, along the one road leading from the camp. The accompanying guards kept shouting at us and driving us with the butts of their rifles. Anyone with very sore feet supported himself on his neighbor's arm. Hardly a word was spoken; the icy wind did not encourage talk. Hiding his mouth behind his upturned collar, the man marching next to me whispered suddenly: "If our wives could see us now! I do hope they are better off in their camps and don't know what is happening to us." A thought transfixed me: for the first time in my life I saw the truth as it is set into song by so many poets, proclaimed as the final wisdom by so many thinkers. The truth – that love is the ultimate and the highest goal to which Man can aspire. Then I grasped the meaning of the greatest secret that human poetry and human thought and belief have to impart: The salvation of Man is through love and in love. I understood how a man who has nothing left in this world still may know bliss, be it only for a brief moment, in the contemplation of his beloved. In a position of utter desolation, when Man cannot express himself in positive action, when his only achievement may consist in enduring his sufferings in the right way – an honorable way – in such a position Man can, through loving contemplation of the image he carries of his beloved, achieve fulfillment. For the first time in my life I was able to understand the meaning of the words, "The angels are lost in perpetual contemplation of an infinite glory." Photograph and Text copyright R. Kawahara, and Asahi Newspaper and image rights belong to Dr. K. Yamada. Self-awareness occurs in different modalities. Sometimes people engage in self-touching when feeling shy (Edelmann et al., 1989), and drink copious amounts of fluids thus becoming pneumatically aware of their digestive tract when suffering from psychosis (see: de Leon, Verghese, Tracy, Josiassen, & Simpson, 1994)*. But generally speaking, human self-awareness takes places in two channels or modalities: through language and though vision. Typically, in Western literature the former, linguistic self awareness is privileged. Mead, the father of social psychology, argues that speech necessarily demands of speakers to hear themselves from the point of view of their listeners (plural), giving rise to the 'generalized other' (Mead, 1967), 'super-addressee' (Bakhtin,1986), 'Other' (Lacan, 2007), and 'impartial spectator' (Smith, 1812). Typically Western theorists argue, by application of common sense I presume, that in order to see oneself however, one needs a mirror. Mead writes "If we exclude vocal gestures, it is only by the use of the mirror that one could reach the position where he responds to his own gestures as other people respond" (Mead, 1967, p.66). However, the recent discovery of 'mirror neurons' (Iacoboni, 2009a, 2009b) , the concomitant neural capability of 'autoscopy' (Blanke & Metzinger, 2009; Metzinger, 2009) and our own work demonstrating that the Japanese, but not North Americans, have "mirrors in their heads," (Heine, Takemoto, Moskalenko, Lasaleta, & Henrich, 2008) demonstrates that Mead's common sense assumptions about human inability to see themselves without a mirror is incorrect. Humans, especially if properly trained through the Japanese arts (Zeami; see Yusa, 1987; Ozawa, 2006) can activate their mirror neurons and hone their ability to learn to see themselves, just as Westerners can and do develop their debating skills and hone their ability to hear themselves from others' and then, importantly, the Other's objective point of view. Cultures differ in the predominance of each type of self awareness. As we have seen, the Japanese have an ability and proclivity to be aware of themselves visually. This is demonstrated likewise by the tremendously positive way in which they portray themselves visually with their poses, fashion, and automatically corrected "puri-kura." That Americans are predominantly aware of themselves in the linguistic domain is, even if one does not believe theorists such as Mead (1967), Bruner, Lacan (2007), Hermans and Kempen (1993), Ricoeur (1990), Derrida(2011), McAdams, Bakhtin (1986)** to name but a few, adequately demonstrated by the way in which they have a strong and robust desire for positive linguistic self regard. All the studies showing positive self regard on the part of North Americans and and equivalent lack on the part of Japanese, for instance, are linguistic. The only studies to demonstrate a greater or equivalent positivity among Asians are visual: auto-photography (Leuers = Takémoto see Mukoyama, 2010, Ch.1), collage (Leuers = Takémoto & Sonoda, 2000), briefly presented flash cards (Yamaguchi et al., 2007), and positivity in recollection of photos. What happens when the non-culturally preferred medium of self-awareness is promoted? Among Westerners it has long been known that, unless they are feeling in a good mood, Mirrors tend to promote a novel mode of self-awareness making them aware of failure to meet social norms (Heine, Takemoto, Moskalenko, Lasaleta, & Henrich, 2008; Sedikides, 1992). The negative impact of mirrors is all the more pronounced when Westerners are in a state of negative affect. It is hardly surprising therefore that, as demonstrated by recent research (Selimbegović & Chatard, 2013), mirrors increases thoughts of suicide among Westerners. And, yet, mirrors are used as a means of preventing suicide in Japan (Oshimi, 1992). After more than two decades of economic stagnation, the level of suicide in Japan has reached historic highs. One way in which Japanese railway authorities have found effective in reducing the level of suicide by jumping in front of passing trains is to install mirrors on platforms. Mirrors are the culturally familiar mode of self-awareness in which the Japanese have learnt to self enhance. To see themselves as loved, lovable, even cute. Remembering the internalised gazes of their loved ones, the Japanese look at the mirror, see the side of themselves that they still love, don't do it and go home. The equivalent stimulus for increasing positive self regard among Westerners has long been known - provide them with a telephone, a listening ear, and an opportunity to narrate themselves. Hearing ones self speak is enough to put your average Western, but not East Asians (Butler, Lee, & Gross, 2007, 2009; Butler, 2012), in a better, not a worse, mood. As recent research (Selimbegović & Chatard, 2013) indicates, increase in the incidence of suicide might arise however if mirrors were situated on the Golden Gate Bridge, or I suggest, if suicidal Japanese were encouraged to narrate themselves***. This last possibility does not seem to be one which Japanese medical health professionals, even Mukoyama (2010), seem to have considered. 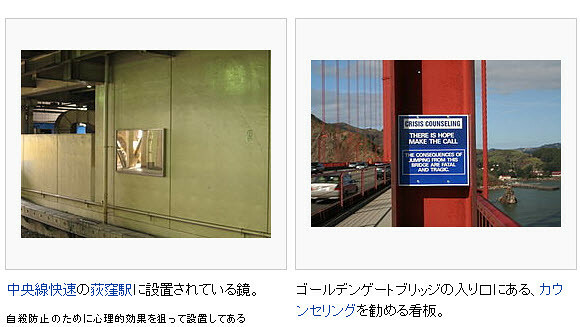 The image above is from the Wikipedia page on Infamous Suicide Spots, showing the suicide prevention mirror on the the platform of Ogikubo Station's Central Line, and a "Crisis Councelling" telephone on Sanfransisco's Golden Gate Bridge. Bakhtin, M. M. (1986). Speech Genres and Other Late Essays. (V. W. McGee, Trans., C. Emerson & M. Holquist, Eds.) (Second Printing.). University of Texas Press. Butler, E. A., Lee, T. L., & Gross, J. J. (2007). Emotion regulation and culture: Are the social consequences of emotion suppression culture-specific? Emotion, 7(1), 30. Iacoboni, M. (2009b). Mirroring people: the science of empathy and how we connect with others. New York, N.Y.: Picador. Mead, G. H. (1967). Mind, self, and society: From the standpoint of a social behaviorist (Vol. 1). The University of Chicago Press.Metzinger, T. (2009). The Ego Tunnel: The Science of the Mind and the Myth of the Self (1st ed.). Basic Books. Mukuyama, Y. 向山泰代. (2010). 自叙写真法による自己認知の測定に関する研究. ナカニシヤ出版. Oshimi, T. 押見輝男. (1992). 自分を見つめる自分: 自己フォーカスの社会心理学. Ozawa, T. 小沢隆. (2006). 武道の心理学入門: 武道教育と無意識の世界. 東京: BABジャパン出版局. Ricoeur, P. (1990). Time and Narrative. (K. Blamey, Trans.) (Reprint.). Univ of Chicago Pr (T). Selimbegović, L., & Chatard, A. (2013). The mirror effect: Self-awareness alone increases suicide thought accessibility. Consciousness and cognition, 22(3), 756-764. Yamaguchi, S., Greenwald, A. G., Banaji, M. R., Murakami, F., Chen, D., Shiomura, K., … Krendl, A. (2007). Apparent universality of positive implicit self-esteem. Psychological Science, 18(6), 498. **I know that I am ignoring Cooley and Goffman. It seems to me that the latter, and those that base there analyses on Goffman's approach such as McVeigh (Wearing Ideology) come closest to the position that this blog espouses but, in Goffman's and McVeigh's case at least it seems to me that their dramatological, 'looking glass self" is 'presentational.' That is to say that the Goffman and McVeigh (if not the Cooley) 'looking glass self" is an image of me for you, for another specific other. And this is the nub of the matter. The Japanese too hear their self speech from the ear of otherS but they lack the "generalized" (Mead, 1967), "super" (Bakhtin, 1986) Other (Lacan, 2006) and they have, and we lack, a generalized gaze of the world. *** Based on Western practice, the Japanese have taken to situating telephones at suicide spots. It seems possible to me that a telephone to the Japanese is a bit like a mirror to Westerners. A telephone encourages people to narrate themselves, and in Japan that, among those that have debt, interpersonal problems, encourages them to narrate themselves negatively in the absence of Eve, a generalized other, super-addressee, or ear that loves them. I know that there is some (though very little) OSA research that uses voice, but I suggest that a telephone is a Nacalianly transformed mirror.